Democrat Andrew Kim, his wife Kammy Lai and their sons celebrate on Election Night. 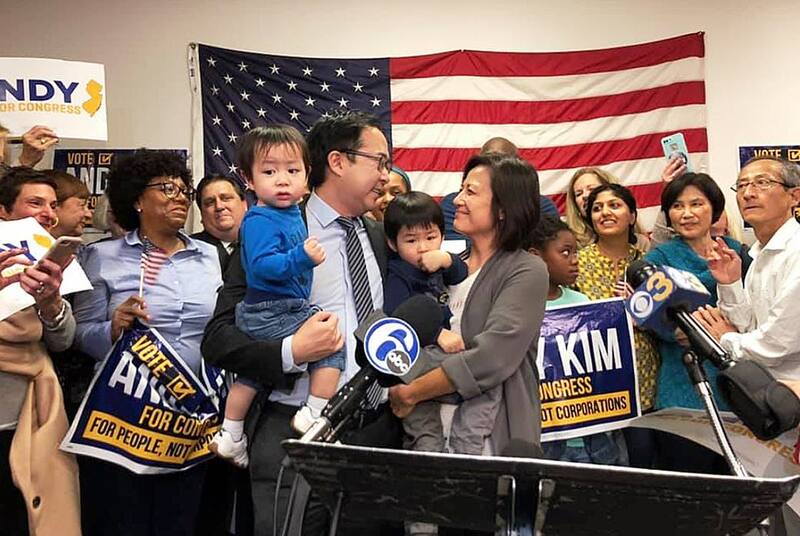 Asian Pacific American candidates in congressional races on Nov. 6 included Democrat Andrew Kim, who defeated the incumbent, Republican Tom MacArthur, in New Jersey’s 3rd Congressional District. According to the latest results, Kim received 150,510 votes (49.9 percent) to MacArthur’s 147,036 (48.8 percent). Constitution Party candidate Lawrence Berlinski Jr. received 3,846 (1.3 percent). Kim will be the second Korean American to serve in Congress. The first was Republican Jay Kim, who represented California’s 41st Congressional District (Riverside County) from 1993 to 1999. In California’s 39th Congressional District, which includes parts of Orange, Los Angeles and San Bernardino counties, it initially appeared that Republican Young Kim would become the first Korean American woman in Congress. However, her lead eroded as more votes were co unted, and Democrat Gil Cisneros over took her, 113,075 (50.8 percent) to 109,580 (49.2 percent). Kim has conceded. Kim served two years at the White House as the director for Iraq at the National Security Council, where he was a point person for coordinating the counter-ISIS war. He previously served in Kabul, Afghanistan as a diplomat and strategic adviser to Gen. David Petraeus and Gen. John Allen when they led coalition forces in Afghanistan, and also worked at the Pentagon, State Department, USAID, and Senate Foreign Relations Committee. Kim received a doctorate in international relations from the University of Oxford and also attended Deep Springs College and the University of Chicago. He and his wife, Kammy Lai, have 3 year-old and 1 year-old sons and live in South Jersey. Following are results for Asian Pacific American candidates in other states (except California, which has already been covered). 1st Congressional District: Republican incumbent Rick Crawford kept his seat, defeating Democrat Chintan Desai, 138,471 (69 percent) to 57,665 (28.7 percent). Desai is am educator from Helena, Ark. He was born in San Luis Obispo to immigrant parents from Mumbai, India. 6th Congressional District: Republican incumbent David Schweikert was re-elected, finishing ahead of Democrat Anita Malik, 122,974 (56.4 percent) to 95,105 (43.6 percent). Malik stepped down from her role as chief operating officer of a content technology company to run for Congress. The daughter of immigrants from India, she was born in Kansas City, Mo. 8th Congressional District: Republican incumbent Debbie Lesko beat Democrat Hiral Tipirneni, 123,681 (56.7 percent) to 94,583 (43.3 percent). Tipimeni was an emergency room technician and is a board member of the Maricopa Health Foundation. She came to America from India with her parents at the age of 3. 2nd Congressional District: Democrat Joe Neguse defeated Republican Peter Yu, 252,220 (60 percent) to 152,617 (33.9 percent). Independent candidate Nick Thomas was third and Libertarian Roger Barris was fourth. The seat is being vacated by Rep. Jared Polis (D), who successfully ran for governor. A son of immigrants from China and Taiwan, Yu is a businessman and a Loveland, Colo. native. 7th Congressional District: Democratic incumbent Stephanie Murphy, who has been in office since 2017, was re-elected, receiving 180,788 votes (57.6 percent) to Republican Mike Miller’s 133,053 (42.4 percent). A former educator, businesswoman, and national security specialist, Murphy is the first Vietnamese American woman and second Vietnamese American ever elected to Congress. U.S. Senate: Democratic incumbent Mazie Hirono, who has been in office since 2013, was re-elected with 268,975 votes (71.1 percent) to Republican Ron Curtis’ 109,170 (28.9 percent). A frequent critic of President Trump, Hirono is the first elected female senator from Hawaii, the first Asian American woman elected to the Senate, the first U.S. senator born in Japan, and the first Buddhist senator. 2nd Congressional District: Democratic incumbent Tulsi Gabbard, who has been in office since 2013, was re-elected with 150,161 votes (77.3 percent) to Republican Brian Evans’ 43,994 (22.7 percent). An Iraq War veteran, Gabbard is the first Samoan American woman and the first Hindu elected to Congress. 8th Congressional District — Democratic incumbent Raja Krishnamoorthi, who has been in office since 2017, won with 124,908 votes (65.6 percent) to Republican Jitendra Diganvker’s 65,576 (34.4 percent). Born into a Tamil-speaking family in New Delhi, Krishamoorthi has served as an Illinois special assistant attorney general and deputy state treasurer. U.S. Senate: Democratic incumbent Ben Cardin was re-elected with 1,341,313 votes (63.9 percent), followed by Republican Tony Campbell with 656,456 (31.3 percent), independent candidate Neal Simon with 79,028 (3.8 percent) and Libertarian Arvin Vohra with 21,006 (1 percent). Vohra is an author, educator and former vice chair of the Libertarian National Committee. He drew flak last year for calling for the abolishment of public schools. U.S. Senate: Democratic incumbent Elizabeth Warren was re-elected with 1,611,665 votes (60.3 percent), followed by Republican Geoff Diehl with 969,499 (36.3 percent) and independent candidate Shiva Ayyadurai with 90,663 (3.4 percent). Ayyadurai is an Indian-born scientist and entrepreneur. He is known for is controversial claim to be the inventor of email. 6th Congressional District: Democratic incumbent Grace Meng, who has been in office since 2013, was easily re-elected with 103,823 votes (90.4 percent) to Green Party candidate Tom Hillgardner’s 10,514 (9.2 percent). Meng, who is of Taiwanese descent, is the first Asian American to represent New York in Congress. 5th Congressional District: Democrat Mary Gay Scanlon defeated Republican Pearl Kim, 189,957 votes (65.1 percent) to 101,861 (34.9 percent). A daughter of Korean immigrants, Kim served as a Delaware County assistant district attorney and as the senior deputy attorney general of Pennsylvania. She would have been the first woman of color elected to Congress from Pennsylvania. 22nd Congressional District: Republican incumbent Peter Olson was re-elected with 152,318 votes (51.4 percent) to Democrat Sri Preston Kulkarni’s 137,500 (46.4 percent). Libertarian John McElligott was third and independent candidate Sara Kellen Sweny was fourth. The son of an Indian immigrant father and a white West Virginian mother, Kulkarni served in the U.S. Foreign Service, including assignments in Iraq, Russia, Israel, Taiwan and Jamaica, and was a foreign policy and defense advisor to Senr. Kirsten Gillibrand (D-N.Y.) on the Senate Armed Services Committee. 3rd Congressional District: Democratic incumbent Bobby Scott, who has been in office since 1993, was unopposed for re-election. Scott, who is of African American and Filipino descent, is the longest-serving member of Virginia’s congressional delegation. 23rd Congressional District: Republican incumbent William Hurd defeated Democrat Gina Ortiz Jones, 102,903 (49.2 percent) to 101,753 (48.7 percent). Libertarian Ruben Corvalan was a distant third. An Iraq War veteran and intelligence officer, Jones is the daughter of a single mother, an Ilocano from Pangasinan, Philippines. 7th Congressional District: Democratic incumbent Pramila Jayapal, who has been in office since 2017, received 328,872 votes (83.55 percent) to Republican Craig Keller’s 64,749 (16.45 percent). Born in India and raised in Indonesia and Singapore, Jayapal previously served in the State Senate and its the first Indian American woman to serve in the House of Representatives and the first Asian American to represent Washington in Congress. As previously reported, APA members of Congress in California, all Democrats, were re-elected: Reps. Doris Matsui (6th CD), Ami Bera (7th CD), Ro Khanna (17th CD),Judy Chu (27th CD), Ted Lieu (33rd CD), and Mark Takano (41st CD). Sens. Kamala Harris (D-Calif.) and Tammy Duckworth (D-Ill.) are not up for re-election this year. Their terms end in 2023. Harris, who is of Jamaican and Indian descent, is considered a top contender for the party’s presidential nomination.